Offer applies to one Guest room or suite per stay, per member, based on double occupancy on dates listed, paying a miles-eligible rate based on check-out date. A “hotel stay” or “stay” is defined as consecutive nights spent in the same hotel, regardless of check-in/check-out activity. Offer not available during special events; tax is additional; special offers cannot be combined; blackout dates may exist; Advance reservations are required. Offer does not apply to groups of 10 or more rooms. Offer valid at participating hotels in Canada for stays completed between March 1 to May 31, 2019. The offer is, earn up to 4,000 bonus Miles per visit. Reservations must be made directly with Marriott®, 1.800.249.0800, www.Marriott.com or hotel-direct, or via a travel agent using promotional code M12. Bookings via third-party online retailers such as Expedia or other wholesalers are not eligible for this promotion. 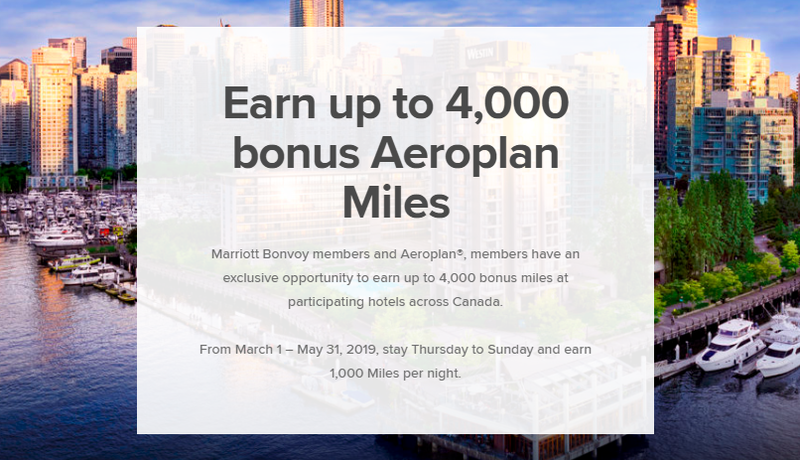 Enrolment with Marriott Bonvoy and Aeroplan is required to participate in this promotion and Marriott Bonvoy members must update their profile before checkout by choosing Aeroplan as their earning preference. Guest must book reservation using promotional code listed above in order to receive bonus miles.